Different grazing management practices have a significant impact on the sustainability of grassland ecosystems. This study invested the vertical distribution of soil nitrogen (N) forms and soil microbial community structures in a semiarid grassland ecosystem under different grazing management practices in Inner Mongolia. Soil samples were collected from three semiarid grassland plots subjected to different long-term management practices namely, free grazing (FG) and two different periods of enclosure (E83, enclosed since 1983 and E97, enclosed since 1997). The soil organic nitrogen (N) pools were analyzed by classical methods, and the bacterial community was assessed by PCR-DGGE and high-throughput sequencing. The surface soil N-supplying capacity was in the order of E97 ≥ E83 ≥ FG. The soil ammonium N, amino N, and N-supplying capacity were greater in the enclosed plots than in the FG plot. Additionally, the 0–40-cm soil layer showed the influence of different management practices on the soil properties. The structure and diversity of the soil microbial community also varied with the management type. 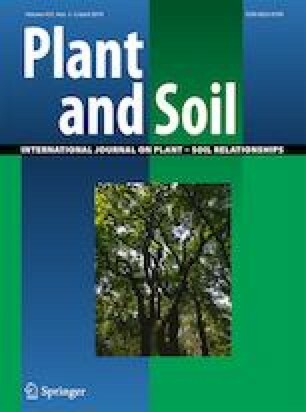 The soil organic N composition was significantly related to the soil bacterial community structure and microbial categories. An appropriate number of years of fencing helps to improve the soil surface nutrient status, whereas overgrazing and prolonged enclosure are not conducive to the restoration of soil nutrients. Different grazing management practices can affect the microbial community structure and turnover of soil N in grasslands. Huanhe Wang and Jiangye Li are equally important as the first authors. Responsible Editor: Elizabeth M Baggs. This work was supported by the National Key Basic Research Program of China (2015CB150502), the National Natural Science Foundation of China (41401266), the Science & Research Program of Zhejiang Province (2016C32084), and The National Key Research and Development Program of China (2016YFD0801103).